It presents a fast releare peppting device for precise peppting & zip quick emptying. The moulded chuck has a silicon rubber collet inside to hold various pippets of standard size. Easy one hand operation Rotation of the thumb wheel draws or dispensers the liquid with precision and ease. By depressing the side lever the entire contents can be dispensed rapidly. Accepts glass and plastic pipettes. Color coded for sizes. 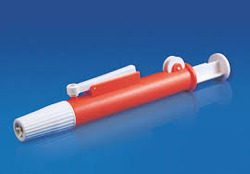 Material used: acrylonitrate butadiene styrene this pipetting device has got a knurled thumbwheel, that can be rotated to draw up or dispense liquids while the releaser may be pushed in for zip-quick emptying. 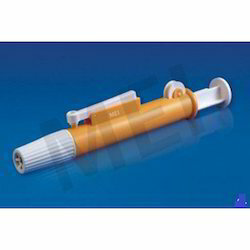 The moulded chuck has a silicon rubber collet inside to hold various standard size pipettes. Resists acids & alkaline. Pipette pump is fast releasing pipette device. this is used for holding various standard size pipettes.